Lots for non painting partners to do in the area. We are ideally situated just a short distance from Devils Bridge and the north of the spectacular Cardigan Bay. We are inland from Aberystwyth and a short drive from the historic harbour town of Aberaeron. This is the path to a new creative you. Our customers return time and time again. 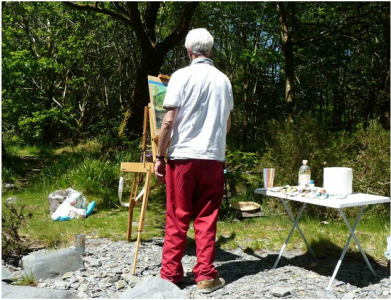 The perfect artists retreat, the workshops are ideal for relaxation and wellbeing. If you want to to return to art practice after a break or you would just like to expand your skills and learn something new. Whatever is right for you. All abilities are welcome from beginners to the more experienced, using your choice of media in a relaxed environment. Cost £50 per person per day, £55 with lunch, and can be combined with a stay at Pengwernydd. All tea, coffee and light refreshments are included. Light lunch is available at £5 per person. If you have any food allergies or intolerances please ask for further information. Please book Art Workshops well in advance to avoid disappointment. Please enquire as new dates are being added all the time. These can be extended into two, three, four and five day workshops and can be combined with a stay at Pengwernydd Cottages. Let us know which dates you would like to enquire about and we will check and get back to you. we have a variety of wild flowers and grasses. The foxgloves flower in the summer months and the livestock are out in the fields. You can choose to 'home in' on the detail or incorporate the wider surroundings and grazing animals. Llantrisant Church - Overlooking Pengwernydd Farm, the little church is set on a hill top and commands stunning views over moorland and farmland dotted with remote cottages. The viewpoint can be the church and its ancient stones or the wider surrounding area. Mountains and Red Kites - In the upland pastures of Pengwernydd Farm, we have amazing views across the Cambrian Mountains. Red Kites and Buzzards call and swoop in the skies above the farm. A rocky crag stands as a sentinel over the miners' cottages below and there is also a lake we can take inspiration from. Romantic Ruins - The surrounding fields are dotted with ruined buildings left over from the mining. The 'romantic ruin', a little piece of history, a glimpse into the past. We will go to the site of one and use the setting in our compositions. Animal Sketching - The animals on the farm make excellent life models, from the chickens to the horse. Sketching, then develop your ideas further. Waterfalls, Myths and Tales - Steep wooded hills, dotted with ancient hill-forts, are cut by plunging watercourses. Experience a landscape steeped in history and legend. Look for evidence of past lives. Imagine the journeys made by pilgrims and monks. And then there's Hafod......... Be Inspired! accommodation, located in the beautiful, tranquil uplands of north Ceredigion - a short drive from the bustling town of Aberystwyth.